Make note, today I am making up a whole new form of visual art called FLARF ART. It is a spin off of Flarf Poetry and it involves putting phrases into Google Images and making pictures out of it. 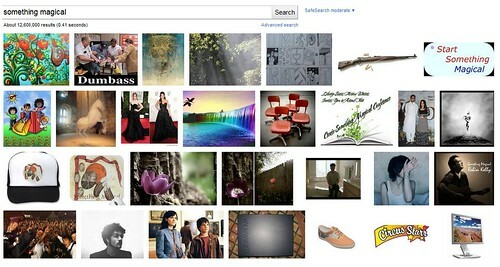 For some reason the phrase, "something magical" popped in my head, so I put that into Google Images and made a print screen of the top results. Here, folks, for the first time in history is FLARF ART. Get ready. I've started an off-shoot of an already existing trend. That can only mean one thing: this is gonna get big. And real real fast.